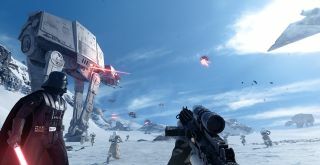 \r Sam spent a few hours with the PC edition of Star Wars Battlefront recently. You can read his impressions of the game, or listen to us chat about it over footage of Sam slaying rebel scum. Sam took a break from playing to make a note of all the graphics options, in case you were interested. Naturally, things may change a little between now and release, but it looks like a pretty complete suite of options is in place already. And if you want to know what it\'ll take to crank these settings to the maximum, check out Star Wars Battlefront\'s system requirements. \r The following settings were all set to ultra for the demo. I\'m not precisely sure what groundcover is, but it might set the detail of foliage, which doesn\'t really apply to Hoth. Battlefront is out on November 17. Edit: there\'s also an FOV slider and motion blur amount settings. These have been added above.